Notes: Designed by Ralph Cutter, a flyfishing guide and naturalist from Nevada City, CA. The Martis Midge imitates the emerging blood midge which can be found in most of the alkaline lakes of the Eastern Sierra. 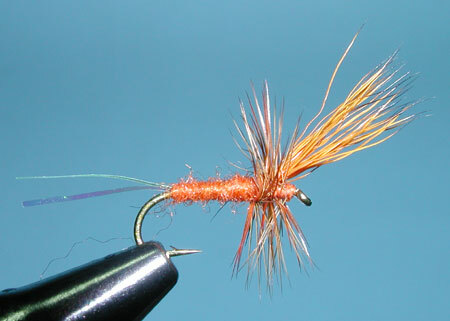 The Martis midge is a large version of the Blood Midge, being tied in sizes 14-16. The Pearl Flashabou represents the trailing shuck that hangs off the emerging midge. The Rust Antron body gives off the effect of the membrane that surrounds the pupae when the blood midge is rising through the water column. The Orange Deer Hair represents the emerging midge and the Furnace hackles represent the legs and wings of the insect. Blood midges are particularly important in Martis Lake as well as Crowley and Davis Lakes. Each of these lakes have an abundant baitfish population that feed on the natural insects present in those lakes. The Blood Midges normally live protected within the mud bottoms of these lakes and are only a food source when they rise through the water column to the surface. The numbers of the hatch are so large that this midge provides an opportunity to present dry flies, such as the Martis Midge, within the surface film.